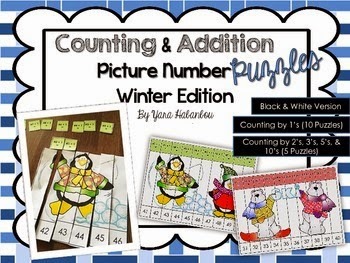 Counting & addition picture number puzzles which include addition facts: There are a total of 15 puzzles included in this pack. 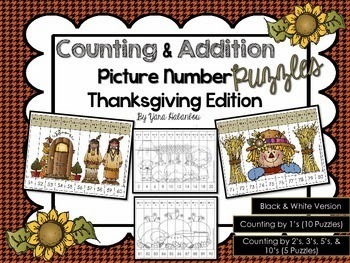 They are also very versatile and can be used in grades K-2 easily to work on counting and addition skills. I have made a winter version and a Thanksgiving version of these. Mt students love them! There is an added bonus of some addition equations at the top also to equal the number at the bottom - but the good news is it's not necessary to use them for lower level students. Here is a freebie to test with your students!